Northwest Vista College students ventured over 5,500 miles from San Antonio to the historic region of Zawiya Ahansal in North Africa last May for NVC’s first Adventure Science experiential learning project. The first leg of their trip landed them in the city of Marrakech in Morocco. 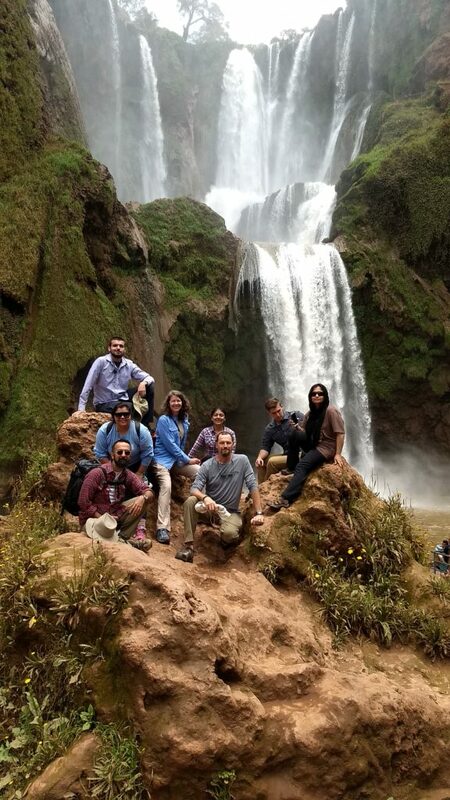 Professor Scott Walker of Geography, and Adam Aguirre of Anthropology then led the six students on a five-hour trip to Morocco’s High Atlas Mountains for field work, trekking, community service, and an incredible cultural immersion experience. This area is relatively isolated from the rest of Morocco due to its unique geography. Students, who were enrolled in Physical Geography (GEOG 1301) for the journey, learned how to measure the water flow and discharge of the local river that is used to irrigate subsistence crops by the people of Amazigh, a village in the Morocco mountains. The Taghia River was a crisp 49° F according to their measurements taken while standing knee deep in the water. Two of the students, Farhana Khan and Marcella Palaferri, with the help of Professor Walker, leveraged the river data into a community service project. They spent the rest of the summer back home crunching numbers to develop a professional 24-page hydrology report they have given to the Atlas Cultural Foundation in Zawiya Ahansal, a region of the mountains that encompasses several villages. This is only the second study of the Taghia watershed ever conducted due to its remote mountain location. The students determined this year’s water flow was up to 542 times more than that found in a previous 2016 study by a professional hydrologist. Marcella, Farhana, and Scott will be presenting the results of their work at the 2018 Southwestern Association of American Geographer’s meeting in Baton Rouge, LA next month. In addition to getting wet and dirty, students conducted interviews of local residents for their Cultural Anthropology (ANTH 2351) class. Each student covered a particular cultural aspect of the community such as religion, the local monetary exchange system, or kinship. “We were humbled by the simple and family oriented life of the Berbers [Amazigh people] and questioned our rat race for more material goods.,” said Farhana. The students also worked in two rural schools teaching English to middle and high school-aged students who speak French, Arabic, and Tamazigh. The program’s mountain guides doubled as Arabic and Tamazigh language instructors, teaching NVC students basic survival phrases such as “mashi moshkil” (no problem) and “la la bzaf” (no that costs too much), among other things like how to count to ten. Scott is working with the Atlas Cultural Foundation to plan another adventure science field study project in 2020. Contributed by NVC Geography Professor Scott L. Waker, ScEdD.